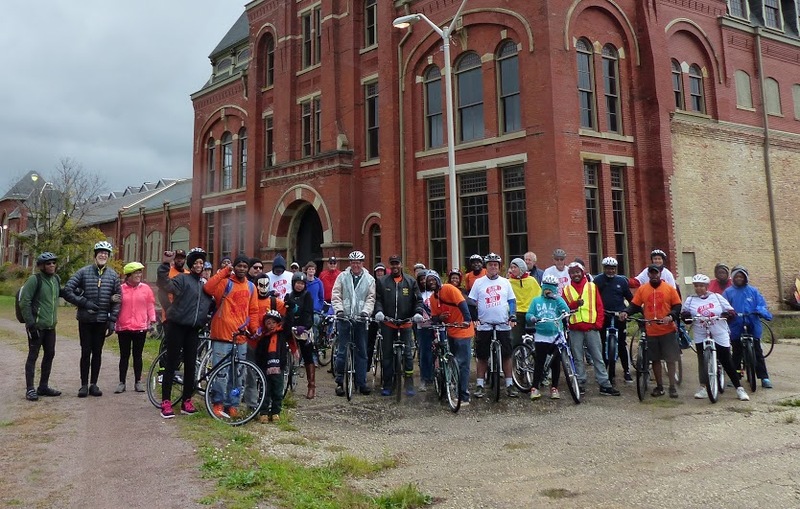 In October, Slow Roll Chicago visited Pullman’s former railcar factory and the Pullman Porter museum. Photo by E. Espoz. Slow Roll Chicago is a new addition to our city’s already impressive roster of community-based bicycling organizations. Inspired by a global bicycle movement that started in Detroit, the local chapter works to strengthen neighborhoods, connect diverse citizens, and transform communities through bicycling. Last weekend, I met with co-founders Olatunji Oboi Reed and Jamal Julien to discuss how Slow Roll provides south and west side communities with a venue to explore their vibrant, beautiful streets. Lorena Cupcake: How did you two get involved with Slow Roll? Oboi Reed: Slow Roll is a global bicycling movement. It was founded as a movement in Detroit by Jason Hall and Mike MacKool in 2010. It started out small, with a few people riding on a weekly basis, and over the years it grew to several hundred, and eventually it grew to several thousand, and just earlier this year, it kind of caught fire in Detroit. Right now, to this day, the Slow Roll average in Detroit is three to four thousand people every Monday night. 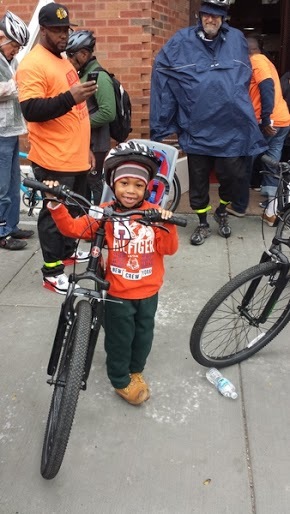 Families joined Slow Roll’s ride to the A. Philip Randolph Pullman Porter Museum. Jamal and I, maybe about six months ago, found out about Slow Roll in Detroit via Facebook. We saw some videos and we just loved this idea of all of these thousands of people rolling slow through Detroit. It’s just an incredible sight to see, even just watching a video. We kind of fell in love with the concept, but for a while we just watched from afar. One day, Jamal and I just both had this idea: we could bring this to Chicago. We reached out to the organizers, the founders of Slow Roll Detroit, and we started a conversation with them about potentially bringing it to Chicago. It took some work, some time, but after a lot of effort we made it happen. We did our first ride here in Chicago on September 20th, and here we are. LC: Can you tell me about the Big Marsh Ride you did this morning? OR: Today, Jamal and I rode with two people from SRAM, a global bike component manufacturing company headquartered here in Chicago. We worked very closely with Randy Neufeld, who’s the SRAM Cycling Fund director (he runs the company’s foundation), and Dan Stefiuk, the manager of road sports marketing at SRAM. 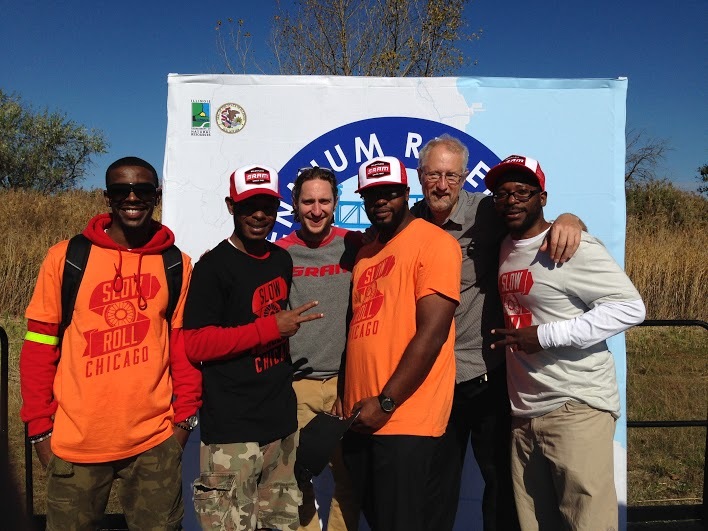 ​We also had with us two people from the management team of Slow Roll Chicago, the team we call #SquadChicago. That includes David Peterson, the executive director of the A. Philip Randolph Pullman Porter Museum, and our good friend Vaughn Coney Varaski, who works for the railroad and is a longtime resident of Pullman. This morning, the five of us rode on out to Big Marsh to explore the creation of Big Marsh into an eco-recreation park. A lot of resources and time and effort are going into that piece of land, and we wanted to just experience it for ourself. [We wanted] to really think about how Slow Roll Chicago could help with community engagement on that project, to ensure that black, brown, and low- to moderate-income people in Pullman, in Roseland, and surrounding communities are engaged in the planning process from the beginning. [They’ll] feel connected to that process, feel a sense of ownership in Big Marsh, and really want to engage beyond just visiting once in a while. We did that this morning — just to ride and experience it. It’s an incredibly beautiful area, and I would encourage you to check it out. We’re likely going to do something November 1st, back over there at Big Marsh. Last weekend, some Slow Roll leaders visited Big Marsh, where the governor announced that new parkland and mountain bike trails would be added to the Millennium Reserve. It just so happened that Governor Quinn was just giving an announcement today about creating public access to Lake Calumet. It’s right in the same area as Big Marsh. That was part of this bigger initiative called “Millennium Reserve.” He made this announcement today about creating public access to Lake Calumet, so that it becomes a local destination for people in the neighborhood, people throughout the city, even an international destination as well. People from around the country, and around the world, could come experience this urban oasis. It’s right here in an urban neighborhood, and it’s just this incredibly beautiful natural landscape that we want people to have access to, and also come and enjoy it. Jamal Julien: The event today is just part of the broader, larger program in which we partner with various community organizations, civic organizations, not-for-profits, and government entities, and bring together a coalition that would begin to highlight the benefits of outdoor activity within their community — without having to travel to Michigan, to Wisconsin, to Indiana to experience nature. We think it’s pretty important that that’s encoded into some of the message that is sent out into the community. We hear a lot of negative information. There’s the narrative that there’s high crime, there’s violence, and that it’s dangerous to go into various communities. But if these people went into various communities that have been indicated as such, if they actually went into the communities and experienced them, I believe that the story would change somewhat. You would see the beauty, the grandeur of the neighborhoods: the meticulously landscaped gardens, the architecture, it’s just so beautiful. For us, it’s important that people from outside the community actually come and see it for themselves, because it will definitely change their opinion about the community, the city, and what it might have to offer. Slow Roll Chicago has a diverse roster of neighborhood partners, such as the Pullman State Historic Site, Kids Off the Block, Pastor Kirk Bell of The New Light of the World Ministries, Working Bikes, the Roseland Heights Community Association, Blackstone Bicycle Works, Greencorps Chicago, West Town Bikes, and the A. Philip Randolph Pullman Porter Museum. LC: What is the importance of working with other organizations? OR: Part of why we work with community partners is that we’re South Side natives, we’re native to Chatham, and there’s going to be neighborhoods that we don’t have a lot of experience with. We want people in the community to feel connected to the Slow Roll Chicago ride and to our organization. We want them to feel a sense of ownership and a sense of community, and the way we achieve that is bringing in people from the community to help with the planning process from the beginning. We are proud to announce that Kozy’s Cyclery and SPARSE are two companies that have signed on as our 2014 Launch Partners. We’ve worked closely with each of these great companies to establish a comprehensive partnership that greatly increases our capacity to bring the Slow Roll Chicago mission and vision to life. JJ: We understand that the cultural dynamics of cycling are different in the black community. As Oboi always says: In black neighborhoods, biking is perceived something that children do, or something White people do on the north side, or [something] that poor people might do because they don’t have access to a vehicle. But we know there are a lot of other intrinsic benefits to cycling. There’s the social aspect: Part of this is meeting new people, networking, and communicating. Usually, we really strive to have a really diverse group, and we’ve been very successful. We’ve had people who have traveled from Downer’s Grove, Barrington, Elmhurst, very far away, to come and see the beauty of Chicago and its neighborhoods. For us, maybe you could say it’s a social experiment, or a real social network. You could say it’s community activism. There are a lot of adjectives or phrases that you might use to describe it, and I would say that we’re all of that — and then so much more. You know, the potential of Slow Roll is endless. Upcoming events for Slow Roll Chicago include a “trail day” at Big Marsh on November 1, a Millennium Park ride on November 9, and Mending Broken Fences,”a ride for peace on Chicago streets” on November 15 from the 11th District police station at 3151 W. Harrison Street. Learn more about upcoming rides and related events by joining Slow Roll Chicago’s Facebook group or following them on Twitter, Instagram, or Tumblr. 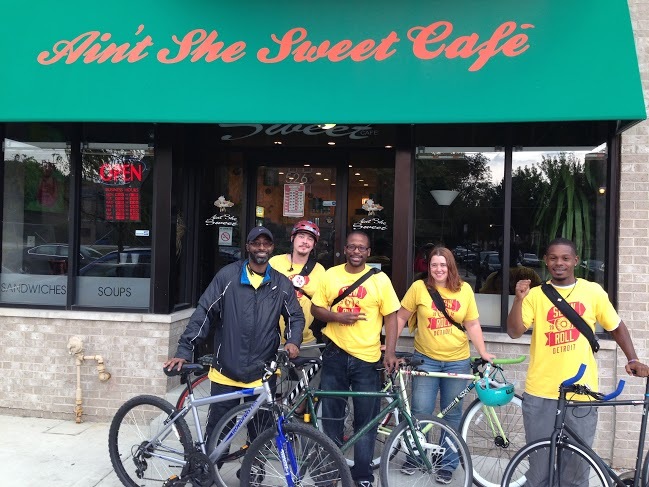 The first Slow Roll Chicago ride visited Ain’t She Sweet, a cafe on 43rd St. Photo courtesy Oboi Reed. Slow Roll co-founder Jamal Julien chatted with me about some of the local businesses that make the South Side such a friendly place to live. Sip & Savor Chicago in Bronzeville, 528 E. 43rd Street: This cozy coffeeshop offers fairly-traded coffees and teas, plus pastries from local bakeries. Blackstone Bicycle Works in Woodlawn, 6100 S. Blackstone Avenue: Young people from all over Chicago gather together to learn about bikes at this non-profit community bike shop. This is a great idea for Chicago. As a far north-sider, some of their rides may be tough for me to get to without driving (which would ruin the fun for me). But I really hope to join sometime. Start with a common interest–riding a bike–and meet new people, see new neighborhoods, learn some local history, build community. Hooray Jamal and Oboi and the Squad for giving Chicago this opportunity. Yes, I drove to Roseland, but if I had any planning sense I probably could have taken a train. But, despite the somewhat nasty weather on that Saturday, it was great fun and I was glad I did. Next ride is rideable–Harrison and Kedzie on November 15. Put it on the calendar! The group leads a discussion of the issue on social media this Thursday morning.